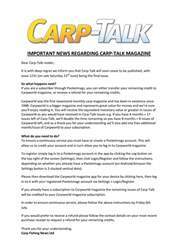 This week’s issue of Carp-Talk (issue 1077) is available to download now. 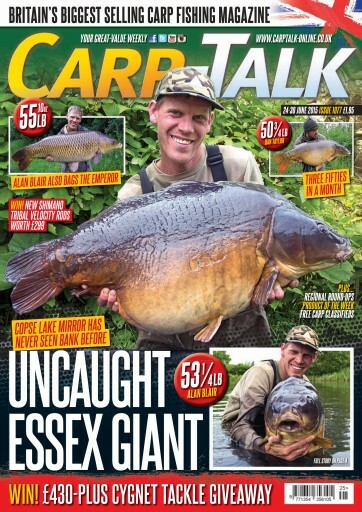 Alan Blair leads the catches this week with a 55lb 10oz common and an uncaught 53¼lb mirror from Kevin Nash’s Copse Lake. We’ve also got a complex record at Fryerning Fisheries, St Ives’ Collin at its biggest-ever weight, and Dan Taylor’s third fifty in a month. 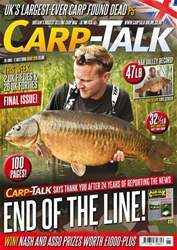 Julian Cundiff temporarily loses the plot, Dave Levy gets the best out of the Korda Heli-Safe System, and Tom Forrester recalls a successful session on the Monument. 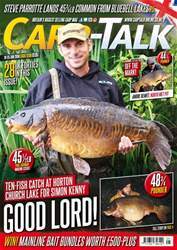 The Mainline Carp Angler of the Year competition continues, and we have £430-plus of Cygnet Tackle and £299 of Shimano Velocity rods to give away.